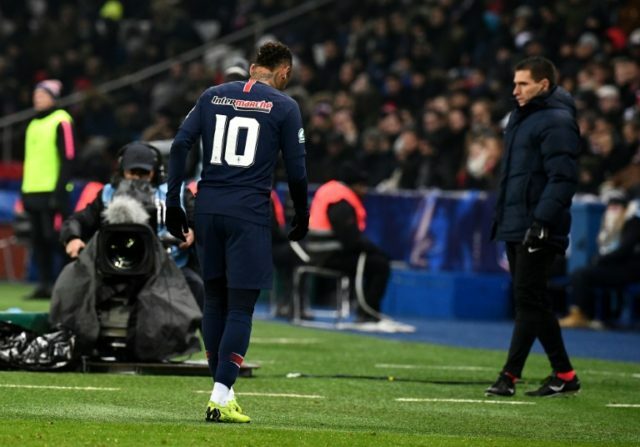 Paris (AFP) – Holders Paris Saint-Germain advanced to the last 16 of the French Cup with a 2-0 win over Strasbourg on Wednesday, but their evening was marred by the sight of Neymar going off injured. Edinson Cavani and Angel di Maria got the goals on a bitterly cold night at the Parc des Princes, while in between Neymar limped off having hurt his right foot. The Brazilian covered his eyes as he went off to be replaced by Moussa Diaby just after the hour mark, a worrying sign for the PSG camp with the first leg of their Champions League last-16 tie against Manchester United less than three weeks away. “He is at the hospital and I must wait for the doctor to give me news,” said PSG coach Thomas Tuchel after the game. The world’s most expensive player broke a bone in the same foot in February last year and missed the final three months of last season as a result.